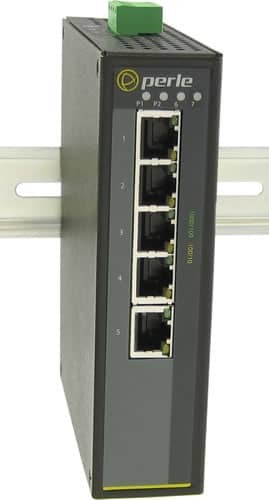 IDS-105G-S2SC10-XT - Industrial Ethernet Switch - 5 x 10/100/1000Base-T RJ-45 ports and 1 x 1000Base-LX/LH, 1310nm single mode port with duplex SC connector [10 km/ 6.2 miles ]. -40 to 75C industrial extended operating temperature. IDS-105G-S2SC10-XT Industrial Switch. 5 x 10/100/1000Base-T Base-T RJ-45 ports and 1 x 1000Base-LX/LH, 1310nm single mode port with duplex SC connector [10 km/ 6.2 miles]. -40 to 75C industrial extended operating temperature. The IDS-105G is designed to stand up to extreme temperatures, surges, vibrations, and shocks found in industrial automation, government, military, oil and gas, mining and outdoor applications. This 6 port Compact DIN Rail Switch provides advanced performance and enables real-time deterministic network operation. It requires no configuration and will instantly operate as soon as you power it up. For complete product details and technical specifications, please visit our IDS-105G 5 port Industrial Gigabit Ethernet Switch Product Page.